TEKLYNX International, the world’s leading barcode and RFID labeling software developer and solutions provider, today announced the TEKLYNX Customer Support Center was awarded a Bronze Stevie® for its notable customer service achievements in the 13th annual Stevie® Awards for Sales & Customer Service. More than 2,700 nominations from organizations in 45 nations of all sizes and in virtually every industry were evaluated in this year’s competition. Winners were determined by the average scores of more than 150 professionals worldwide in seven specialized judging committees. 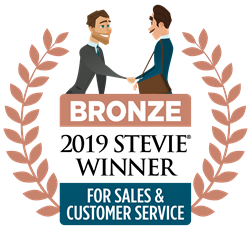 The TEKLYNX Customer Support Center was awarded a Stevie® Award for achievements following the company’s recent customer service initiative designed to raise its customer service bar even higher. The initiative, which included a new customer support structure and the rollout of LIVE customer support Monday-Friday, 8AM-5PM CST, increased customer service to historic levels for the barcode and RFID labeling software solutions provider. To learn more about TEKLYNX visit teklynx.com. To learn more about the Stevie® Awards for Sales & Customer Service and view the complete list of Stevie® winners visit http://www.Stevie®Awards.com/sales. TEKLYNX International is the world’s leading barcode and RFID labeling software developer and solutions provider. An industry innovator for over 30 years, TEKLYNX helps companies operate smoothly and efficiently by implementing labeling solutions that streamline operations while staying ahead of industry-specific compliance and emerging regulations. TEKLYNX is world-renowned for its customer service; offering flexible purchase options, unparalleled service and support, and a comprehensive product offering that grows with companies over time. With operations in the United States, Europe, Japan, Latin America, China and Singapore, more than 750,000 companies in over 170 countries look to TEKLYNX integrated software solutions for their standard of success. Learn more by visiting teklynx.com, LinkedIn, Twitter @Teklynx, and Facebook.com/TEKLYNXInternational or call 888-629-4444.